Discover why our customers and partners choose NevisDATA to monitor and measure. How it works? What can it do? What services are integrated in NevisDATA? What type of solutions offers? 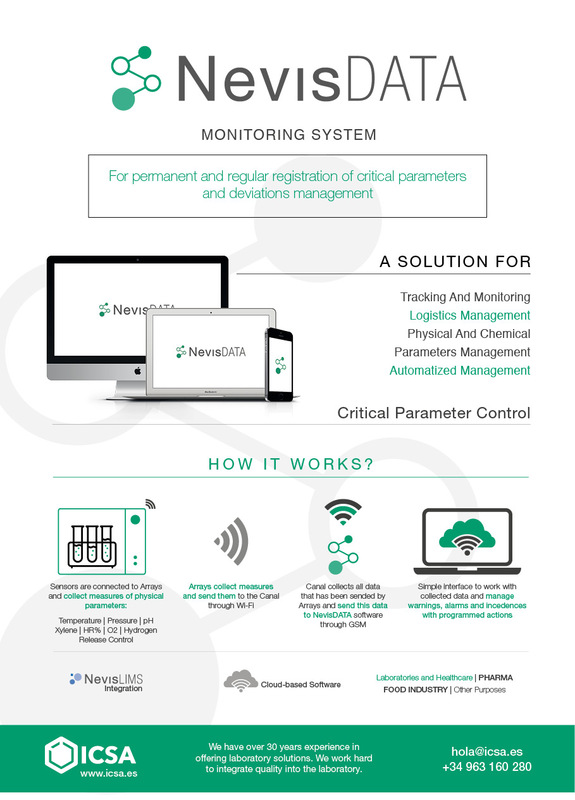 NevisDATA is a monitoring system for permanent and regular registration of critical parameters (temperature, pressure, etc) and deviations management. Tracking and monitoring: it allows to monitor real-time samples, reagents, vaccines, etc. NevisDATA ensures a real-time monitoring anytime, anywhere. Logistics management: t can be used to manage automatic stocks and warehouses. By using RFID tags or QR codes, NevisDATA can monitor and track each item in stock. Physical and chemical parameters management: NevisDATA provides a wide range of sensors which make the system capable of monitoring many physical and chemical parameters and registering data that can be used for a wide range of purposes. Automatized management: NevisDATA can be attached to other automatic devices or switches to work together. This is useful to extend the automatic device’s functionality or to monitor the state of the device. Managing incidences, warnings and alerts. Managing all registered incidences or alerts immediately and in real-time..